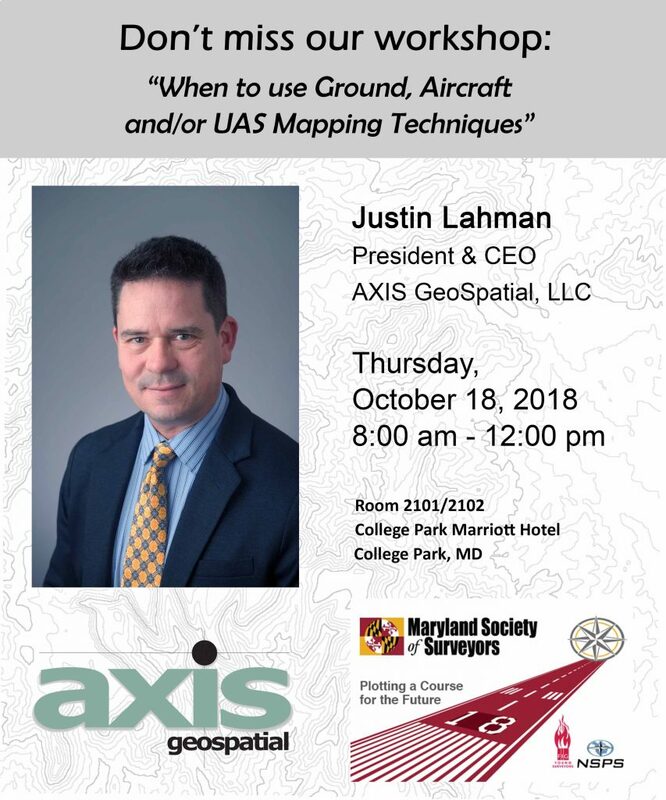 Justin Lahman, President and CEO of AXIS GeoSpatial is scheduled to present at the Maryland Society of Surveyors 52nd Annual Fall Conference & Exhibition on Thursday, October 18 from 8-12 am. Lahman’s session will cover today’s decision process of three automated surveying technologies when approaching a mapping project. The session will present considerations for using land surveying, aircraft, UAS and/or a combination of the three techniques for a particular mapping project. Scope, accuracy, precision, site location, site conditions, site access, FAA airspace limitations, deliverables, budget and schedule will govern which decision you must make in order to be competitive while operating within state and federal laws. Click here to learn more about AXIS’ capabilities.